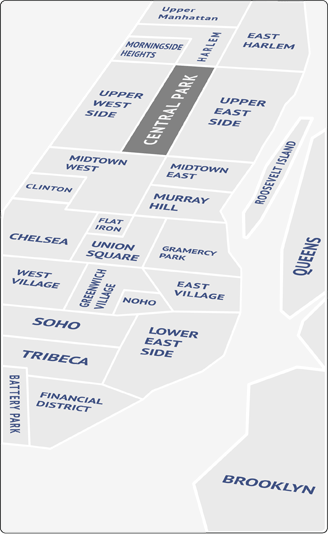 “The Village” runs from Houston Street to 14th Street, then from Broadway to 6th Avenue. This legendary area has long been known as a bohemian/artistic center with a small-town feel. Cobblestone streets and mom-and-pop stores still dominate the area. Cozy cafes, antique shops, upscale boutiques, and parks fill the area. Predominately residential, most parts of Greenwich Village comprise mid-rise apartments, 19th-century row houses and the occasional one-family walk-up. Many residents live in subsidized student housing. Apartments in the Village are some of the most sought after in Manhattan and likely include brick walls, fireplaces, large windows and lots of ambiance. Highlights are Gotham Bar & Grill, Babbo and Caffe Reggio (Greenwich Village's oldest cafe and a wonderful reminder of its bohemian past). Some streets are lined with cozy Italian eateries and cafes. Il Mulino is one city’s most revered old Italians. There are entertainment options galore. The Village is home to many Off Broadway and Off-Off-Broadway theatres. The legendary Village Vanguard and The Blue Note are still presenting some of the biggest names in jazz. There are comedy clubs and The Bitter End, NYC’s longest running rock club. Each year on October 31, it is home to New York's Village Halloween Parade, the largest Halloween event in the country. Visit The Cage for the citywide "Streetball" amateur basketball tournament. New York University's art collection has been housed at the Grey Art Gallery, which is notable for its museum quality exhibitions of contemporary art. The historic Washington Square Park is the center and heart of the neighborhood, but the Village has several other, smaller parks. Perhaps the most famous, though, is "The Cage", officially known as the West Fourth Street Courts where you can play basketball and American handball. Nowhere but up for Greenwich Village. NYU is constantly building and refurbishing, and landlords are following suit. Close access to the funky East Village and the beautiful West gives this neighborhood a little bit of everything.